The Zoo, an eclectic bar, is the brainchild of well-known Delhi models Sapna Kumar and Michelle Innes. That the duo has an eye for the unusual is evident in the vintage sofas, faux snakeskin-printed walls and bar stools with paw-shaped legs. This bar can accommodate about 40 people inside and is open from 7pm onwards. Inside the bar, the midnight-blue dome of the roof with its zillion tiny convex mirrors is spectacular. You cannot help but be mesmerized by the play of light when laser beams flash on these and on the one wall with similar mirror work. The whole bar just sparkles. One of the walls acts as a projection screen on which scenes from black and white movies such as Hitchcock’s Stage Fright were played the night I visited. “We hope to start a film club soon," says Innes, while Kumar adds that they will use this wall for one-off video art installations too. 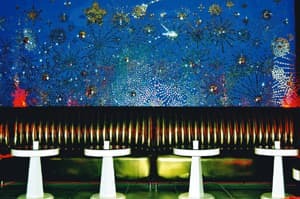 A gorgeous French Baroque-style sofa next to the music console and the large disco balls hung above the minuscule bar add to the now-retro, now-vintage look of the bar. In the absence of a house DJ, the music list is pre-decided everyday by Innes and she seems to favour artists such as mid-1990s musician Jeff Bukley, who played alternative rock. Apart from spirits and wines, only six cocktails are listed on the menu, but Kumar says you only have to ask for the drink you want and the bartender will be happy to make it. Innes and Kumar are clear that they are not looking to grab the dinner crowd and have kept the nibbles menu limited to marinated olives, crispy calamari, omelettes and cheese, a cold cuts platter and other such small eats. I tried the potato wedges with bacon and cheese (Rs250). The portion was tiny (about six wedges which were fried, not baked) with slivers of bacon (could hardly taste it) and almost no cheese. The accompanying hot and tangy salsa prepared with fresh cherry tomatoes was superb, though. The choices in the spirits section are limited but Innes says that’s deliberate. “We do not think it adds to a bar in any way to overstock liquor brands," says Kumar. Also, the music console with its wires sticking out—the DJ here doesn’t have a cubicle to himself—looks tacky, but Kumar says they wanted it that way so that people have easier access to the DJ. A glass of Sula Sauvignon Blanc costs Rs350; 30ml of Jack Daniel’s, Rs350; and 30ml of Baileys is also for Rs350. The bar snacks menu starts at Rs200. Service charges and taxes extra.